Zoom in on another painting by Braque. Find out about the lives and work of the world’s most famous artists, including Van Gogh, Dali, Monet and Warhol, in this beautiful information book. 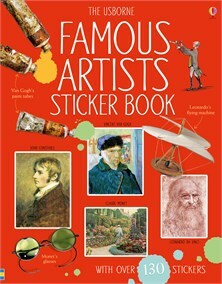 Each page is filled with fascinating facts and photographs of the artists’ works, and there are over 130 stickers to add to the pages and links to specially selected websites for more information. Megan studied English at university and then went on to write books for Usborne. She’s now teaching English to children in a secondary school, where Usborne books make a regular appearance!